Attack ads are our bread and butter at The Fact Checker — and, boy, are we swimming in butter this week. 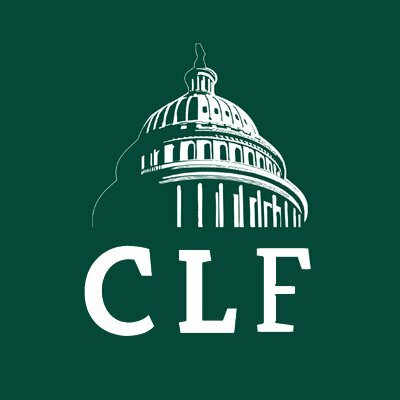 The Congressional Leadership Fund, a super PAC aligned with House Speaker Paul D. Ryan (R-Wis.), has been running a series of negative ads about Democratic candidates in close races across the country. The super PAC has raised more than $100 million and, with control of the House up for grabs in November, the group's wall-to-wall advertising strategy seems to make sense. But the attack ads themselves don't make much sense. We rounded up six 30-second spots released by the Congressional Leadership Fund over the last two weeks. These were literally the first six ads we clicked on while browsing the super PAC's YouTube channel. The ads almost unfailingly portrayed Democrats as dangerous and outside the mainstream. A Rhodes scholar with a Harvard Law School degree is depicted as a profane and "disturbingly radical" rapper. (He's African American.) An ex-Marine gets an unsavory close-up of his tattoos and is accused of voting in the Maine legislature to allow others to buy tattoos with welfare funds (not quite). Two Democrats are wrapped up with terrorists in the ads, but neither claim really adds up. Pureval is the Hamilton County clerk of courts. He worked as an antitrust litigator at White & Case, one of the biggest law firms in the country, from 2008 to 2012. It was his first full-time job out of law school. He was not involved in the firm’s work settling terrorism-related lawsuits that had been filed against Libya in U.S. courts. Libya hired White & Case in 2008, and other lawyers at the firm helped negotiate a bilateral agreement with the United States that led Libya to pay $1.5 billion to the families of terrorism victims, including the 189 Americans who died in the 1988 bombing of Pan Am Flight 103 over Lockerbie, Scotland. "The Libya settlement deal discussed in the ad was approved by Congress," said Sarah Topy, a spokeswoman for Pureval. The deal was so uncontroversial that it passed the House by unanimous consent. The incumbent in this Ohio race, Rep. Steve Chabot (R), was a member of the House at the time. Pureval "never worked on a matter associated with Libya" and "was never a lobbyist," Topy said. Gov. Andrew Cuomo (D) tried to lure the Austrian chip maker AMS to upstate New York, promising $585 million in state funds to build a plant in Utica that would have added an estimated 1,000 jobs. AMS eventually pulled out of the deal, citing delays by New York officials. The Cuomo appointee who initially led this project, Alain E. Kaloyeros, was indicted on bribery and bid-rigging charges right around the time AMS withdrew from the deal in November 2016. (Kaloyeros has since been convicted.) Brindisi, a state lawmaker representing the Utica area, was not involved in the corruption allegations. “I think the governor’s office, essentially, when it came to economic development upstate, turned the keys over to Alain Kaloyeros, and unfortunately in the case of Utica, Alain drove the bus right off the cliff,” Brindisi told the Times. In any case, it’s misleading to say this star-crossed deal led to “lost money” and “lost jobs.” The $585 million Cuomo had pledged was not paid out to AMS, and no jobs were lost in the traditional sense of the word. It’s more accurate to say 1,000 jobs were promised but not delivered. The Congressional Leadership Fund pointed out in a news release that New York spent $78.2 million upgrading the Utica site and surrounding areas. That's not quite the $585 million mentioned in the ad itself. Brindisi spokesman Grant Fox said: "This argument falls apart the minute they find a tenant. That's no longer 'wasted' or 'lost' money in any sense of the word." Finally, it’s worth noting that reporting by the Albany Times Union suggests the New York delays and Kaloyeros’s conviction were not the main reason AMS pulled out of the Utica deal. “New documents obtained by the Times Union appear to show that the major reason for the collapse was complaints by the firm's Austrian executives that the lucrative [$585 million] incentive package — one of the largest ever in state history — was not sufficient to build the factory, or ‘fab,’ that they wanted,” the Times Union reported in January 2017. Delgado is a Rhodes scholar and Harvard Law School graduate who worked at one of the largest law firms in the country, Akin Gump, until January 2018. But this ad would lead viewers to believe that he’s something much different: a foul-mouthed and "extreme" rapper angling for a congressional seat. Delgado’s brand of rap was frankly pretty tame and even wonky. In a previous attack ad, the Congressional Leadership Fund flashed an image of the Twin Towers burning on 9/11 while playing one of Delgado's lyrics, "God bless Iraq." Here's a fuller look at the lyrics from which that line was plucked: "We must fight with love and goodness in our hearts and peace in our minds if democracy, equality and freedom are truly to prevail. God bless America, God bless Iraq, God bless us all." Another set of lyrics from that song: "More than 40 times the lives lost on 9/11 and 10 times just for the lives of Iraqi civilians; $283 billion and counting is what we're spending, but terror alive and well, it seems further from ending." “Issues like income inequality, issues like gender equality, issues like the pollution of our environment and climate change — these are all issues that I talked about back then as an artist that I’m now talking about," Delgado told the New York Times. Courtney Alexander, the Congressional Leadership Fund's communications director, defended the ad. Golden, an ex-Marine who served in Afghanistan and Iraq, has tattoos on one arm and this ad showcases them in an unappealing light. Had this bill failed in Maine, the federal government still would have required the state to ban the use of welfare funds at "liquor stores, gaming or gambling establishments or adult entertainment venues," or face financial penalties, according to the National Conference of State Legislatures. A spokesman for Golden said he "has stated on the record he is opposed to the use of SNAP [food stamps] for such purchases," meaning tattoos, tobacco, alcohol and other items. The attack ad also criticizes Golden for opposing President Trump's tax cuts, to which Golden responded that he once voted in favor of cutting Maine's income tax. A Democratic candidate for the California State Assembly, Melissa Fazli, accused Cisneros of sexual harassment. Cisneros allegedly was drunk and asked to join Fazli in her hotel room one night in February 2018, during the California Democratic Party’s convention in San Diego. A week later, Cisneros allegedly asked “what are you going to do for me?” when Fazli called to request a campaign donation. The Cisneros campaign sent us a statement from Thomas Rivera, the candidate’s personal aide. Rivera denied Fazli’s claim and said he was with Cisneros at the convention when they ran into Fazli. “I accompanied Gil Cisneros throughout the night of February 24th,” Rivera said. “While walking to the SEIU-United Healthcare event, we ran into Melissa Fazli, who asked for a campaign donation, which Gil declined. Gil was not intoxicated, nor did he make any suggestive joke or ask. Minutes later we met and spoke with Jim Gallagher.” Fazli denied that Rivera witnessed the encounter. Our question is what made the Congressional Leadership Fund feel comfortable running with these allegations in an attack ad. We asked a representative for the super PAC whether the group’s leaders believe Fazli but did not get a response. It’s not clear how Fazli could have so gravely misconstrued her interactions with Cisneros to the point of making repeated explosive allegations of sexual harassment for almost five months. On Sept. 20, a few weeks after this fact-check was published, Fazli reached out to The Fact Checker to renew her allegations and to deny a statement from Cisneros’s personal aide that challenged her version of events. On Oct. 1, Fazli said she recanted after an intermediary arranged a meeting with Cisneros that cleared the air. We did not weigh in on the veracity of Fazli’s claims in our initial assessment of this attack ad. Now, it’s clear the ad is entirely false, though the fault lies with Fazli as much as the Congressional Leadership Fund. This was a thorny political issue during President George W. Bush’s administration, but as a matter of law, it’s now well settled. In 2008, the Supreme Court ruled in Boumediene v. Bush that Guantanamo detainees had a right to a hearing to challenge the basis for their detention. 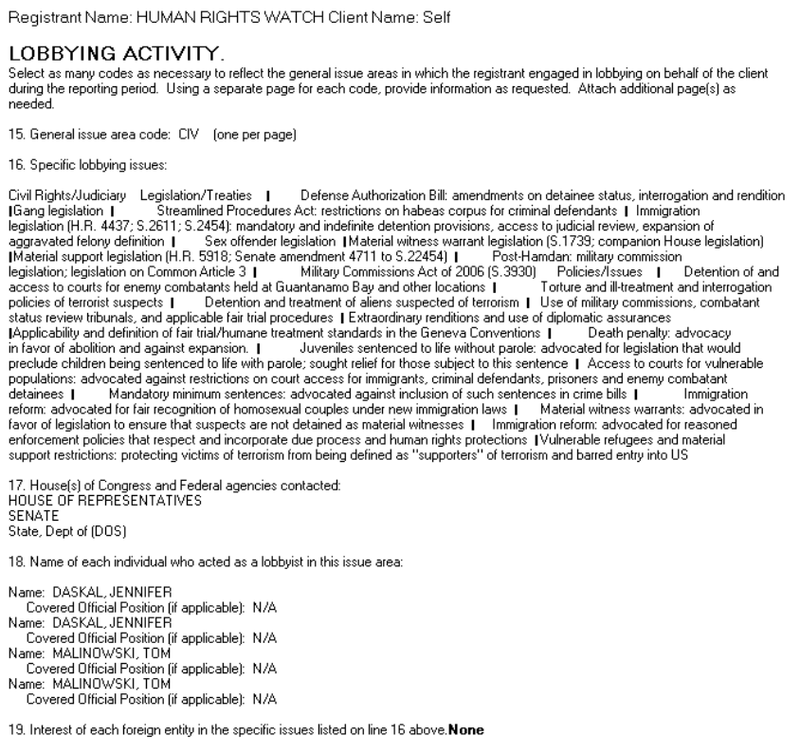 The attack ad itself doesn’t mention Guantanamo detainees, and Malinowski’s 2007 lobbying disclosure form lists a range of issues, not just Guantanamo. But the Congressional Leadership Fund later clarified that the ad was referring to Malinowski’s lobbying work on Guantanamo. Even by modern mudslinging standards, these ads by the Congressional Leadership Fund stand out for their dark tone and their strained relationship with the facts. These attack ads are grossly misleading. 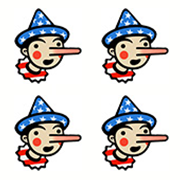 We give them a cumulative rating of Four Pinocchios.